With Veterans Day this week, it’s worth considering the many honored servicemen and women and their descendants who look back upon their medals or accolades in remembrance of their service and their fellow comrades. 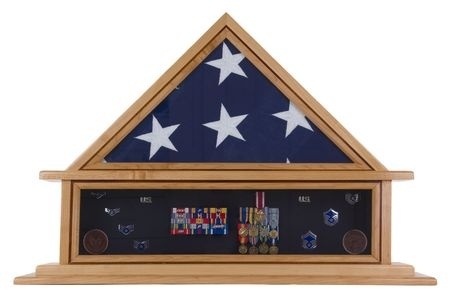 Whether you’re a former service member or the son or daughter of a veteran, you want to keep the medals and other memorabilia safe and secure, perhaps even on display. For these items – and so many other awards, mementos and other cherished keepsakes – shadow box frames are a great option. Shadow boxes come in all shapes and sized, but share a depth component that isn’t typically found in standard frames. This allows shadow boxes to not only provide a bit of depth and protection from direct lighting that can fade items, but also permits thicker items to be placed within the casing for display or posterity. Some boxes may be only a few centimeters deep, while others may be several inches. The style and cut is entirely a matter of personal preference and what item or items you need to accommodate within the frame. Shadow boxes are also a great way to collect together several items as a sort of collage piece. As mentioned above, you could collect old patches, medals or other items from your period of military service, or perhaps Boy Scout patches or high school sports awards together as a way to capture together your memories of these fond days in your past. Plus, by securing items on a padded mat and covering them with a glass or plastic pane, your items will be protected from wear and be held securely in place to prevent damage. At L.A. Frame Co., we specialize in custom framing designs and repairs and can create unique solution that will work perfectly for your needs. For more information on our framing styles and corners or to discuss your specific idea, contact us today.